My family loves dates. They are naturally sweet (so a few go a long way) yet are high in fiber, potassium, magnesium, manganese, and B6 vitamins. 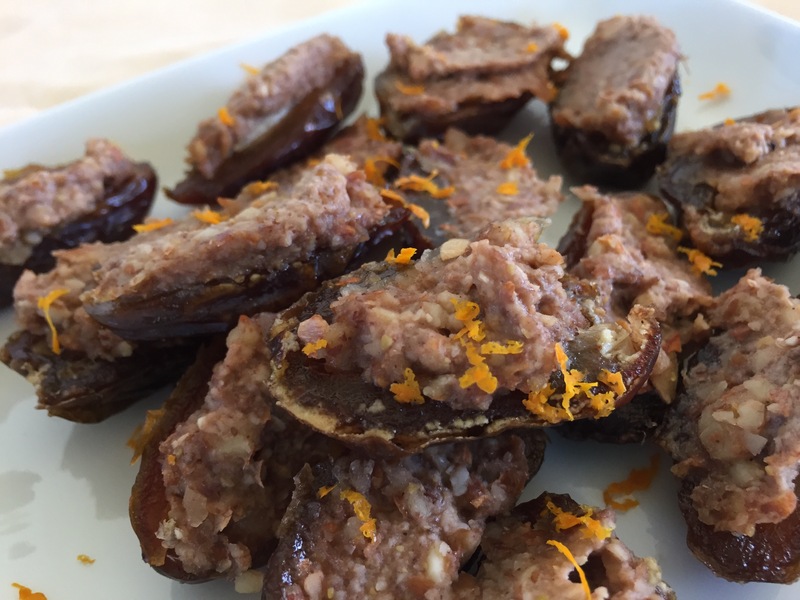 I chose to stuff these dates with more potassium (banana) and more manganese (almonds) with a hint of orange. Yep. These were a hit in our home for an after-dinner treat. Place almonds into a glass jar. Zest and juice the orange and pour over the almonds. Allow to soak for at least an hour. Place almonds and liquid into a food processor. Turn on food processor and allow to run until the almonds are finely ground. Add in banana, flax, honey, vanilla, and cinnamon. Process until thoroughly combined. Slice dates in half and remove pit if they are present. Fill each date with about a teaspoon or so of the banana nut mixture. Garnish with orange zest. Serve immediately or cover and refrigerate until ready to serve. Allow them to sit out for about 10 minutes so the dates soften up a bit. NaturalNews.com – You Will Find Me There!